Blaine WA, United States - November 17, 2018 /MarketersMedia/ — FIDELO is the producer of one of the best-selling carbon fiber minimalist wallets on Amazon, with more than 50,000 units sold across their entire product line. Now the company has expanded its offerings to include a new, ultra-modern men’s wallet dubbed the “Titan.” The Titan money clip wallet and credit card holder is constructed of high-grade black brushed aluminum for a sleek, stunning look. Like all FIDELO minimalist wallets, the Titan securely holds currency and up to 15 credit cards which are easily accessible via the unique “Pinch & Push” design. The wallet also blocks RFID to ensure data security while also slipping easily into a front pants pocket or shirt pocket with zero bulk. To celebrate the launch of the Titan aluminum minimalist wallet, FIDELO is offering a special limited-time introductory discount to introduce it to the public. With so many other cheap aluminum travel wallets on the market, consumers should pay attention to the construction and design details when purchasing one. The Titan wallet is constructed of premium grade 2mm thick aluminum with a brushed finish and a sophisticated black tint. It is resilient against scratches, feels amazing and performs for years. The design features intelligently beveled edges which not only make it very easy to insert cards but create a sharp highlight effect. The Titan money clip wallet comes with multiple black bands which keep cash fully safeguarded and accessible. Every aspect of security has been considered in the Titan wallet for men by FIDELO. In addition to physical safekeeping, the Titan provides electronic reassurance with its RFID blocking technology. As Forbes has reported, the risk of identity theft is a growing concern, but one that has been eliminated with the Titan. FIDELO’s RFID blocking technology is designed and tested to block 13.56 MHz frequencies – those associated with debit cards, credit cards, passports and other RFID uses – but also allows 125 KHz frequencies to pass through, which are those used by security access cards, hotel room keys and similar cards so the user doesn’t have to pull out their card wallet every time access is needed. The Titan brushed aluminum wallet measures 3.4” x 2.25” with enough room for up to 15 credit cards, ID cards and driver’s license. 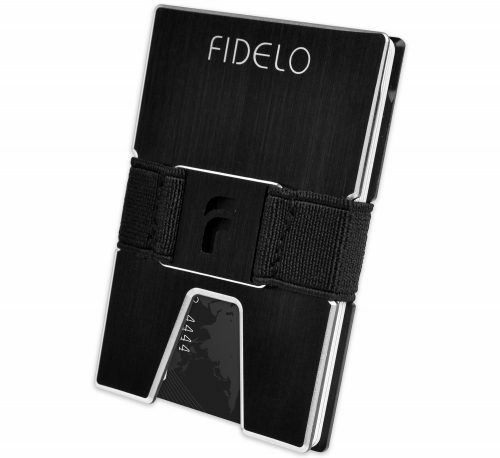 Like all FIDELO wallets for men, the Titan is backed by a risk-free 100% Customer Satisfaction Guarantee. Consumers can take advantage of a special discount price in recognition of FIDELO’s new aluminum minimalist wallet, the Titan, Claim Offer Here. Supplies are limited so act fast!